I am originally from New Jersey, so I never thought i'd be a Long Island Pakistani Wedding Photographer. This image was captured at the Inn at Great Neck in Long Island, NY, as the beautiful bride Zaynah was getting ready for her Valima reception. It was quite a hike traveling to Long Island from my place in Jersey. The drive was absolutely worth it as we captured some amazing shots throughout the day. This shot was one of my favorites while the bride was getting ready. The only light source used here was some soft light coming from a window. Sometimes, that's all you need. As a professional photographer you have to make the call whether you want to use the available light, create your own light, or use a combination of both. Sometimes it's best to keep it simple, especially when you have limited time available to capture certain shots. The big advantage of having a lens that has a maximum aperture of 1.2 is that you can get some great shots when working with available light. This image was captured using my dreamy 85mm 1.2 lens, which is a beast of a lens. I like this shot for a number of reasons, I love the bride's look as she is looking down, whilst admiring her jewelry. 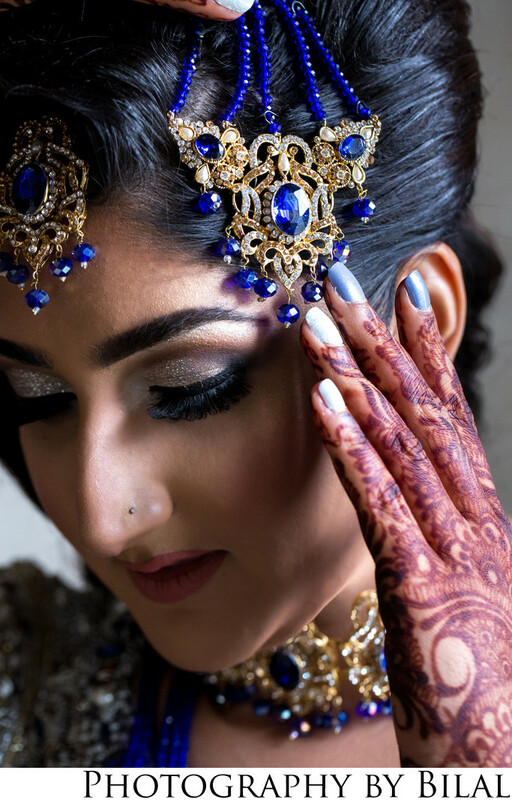 This image captures many details all at once, the henna, the jewelry on head, neck, and forehead, and of course the bride's makeup. Especially the eye makeup which just pops. Location: 30 Cutter Mill Rd, Great Neck, NY 11021.